Why Local Number Is a Friend To Your Business? Everyone talk about the benefits of toll free numbers for businesses. But while starting a small business, you must consider local numbers for your business. You need to make sure that what kind of number is right, a toll free number, a local number or both for your company. A toll free number gives your clients an easy way to communicate, local numbers also have number of benefits for your business. Local numbers are specific to a local area & create a physical presence of your company. In recent time, local numbers become popular among successful businesses. it gives a local presence of your company in a specific area or city. It is a easy way for your customers in the area to communicate or contact with your company. Ads which contains a local phone number receive more calls, because customers prefer to invest a local business which shows their community & which is familiar to them. You can also increase your local presence through local business listings, online search results. Your website can also get more visibility in Google results, because Google new update is based on local search. If you want to get more potential customers in your targeted region, local phone number is the best way to do that. Customers prefer doing business with a company which appeal that your company close to them. Local phone numbers have ability to create a sense of community with customers. You must connect with people to become a large company & this number will give you an opportunity to connect with your clients or users. So, it is clear that local number is valuable tool for business which gives local presence that a company needs. 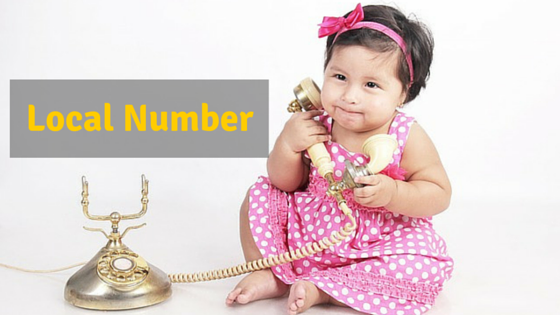 Just like toll-free numbers, local numbers will boost your business. Consider your specific business needs, customer base and choose a number which is right for you. Also Read: What is The Difference Between Toll Free Number and Local Number?